Been working in the lab to balance flavors, colors and base emollients. Ten different flavors of lip balm, twelve different flavors of lip gloss. I think I have most of these elements close to the finish line – now the job is to weave these different elements into finished product. You can see in this picture the two different types – in the foreground are early versions of the lip gloss. I start out with small 2gm batches (this uses very little ingredients and works my chops with the scale;-) and the initial gloss experiment batches are poured into these little cups. The balm experiments are poured into the regular containers because the packaging cost is less. Some flavors are worked out in two or three pours, but most of them require more. Each pour takes at least one hour – to allow time to work out the numbers in Excel, and measure each ingredient. (Sometimes longer if I get stumped with a problem or fail to take an ingredient out of the fridge early to warm up.) Now that I have these different elements worked out, I’ll pour each completed gloss formulation into the small plastic containers for evaluation. If I’m happy with the outcome, will pour into the gloss brush package to test for compatibility. After this stage is complete – work on my spreadsheets – making sure that the final version is the one saved in my ‘Final version’ file. Then, will hook up each spreadsheet with the ‘Cost of Raw materials’ spreadsheet for cost evaluation. 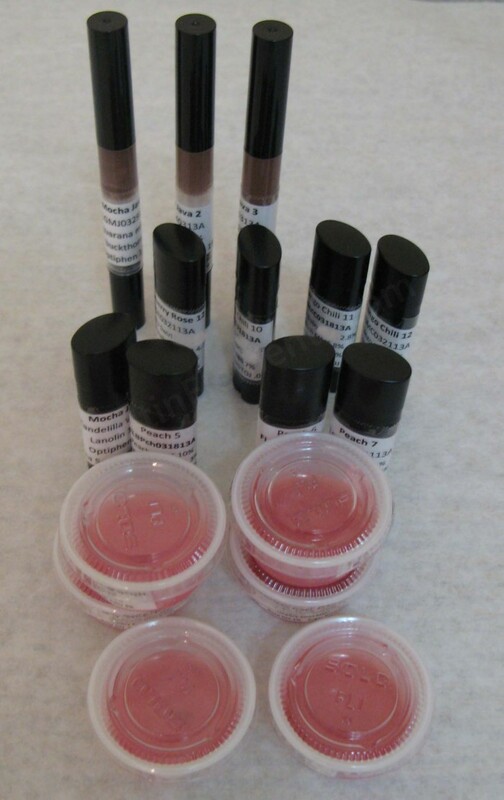 I can’t wait to get these fun balms and glosses to market! I have my eye on a little market not far away that only allows hand crafters. Hope to see some of you there, details forthcoming.